While log home owners in Ontario enjoy living within the beauty and warmth of their wooden homes, many also enjoy outdoor living which is why a large number of log homes are designed and built to accommodate porches and decks. It is evenly important to take the same care and attention you give to your logs to maintaining your decks and porches. 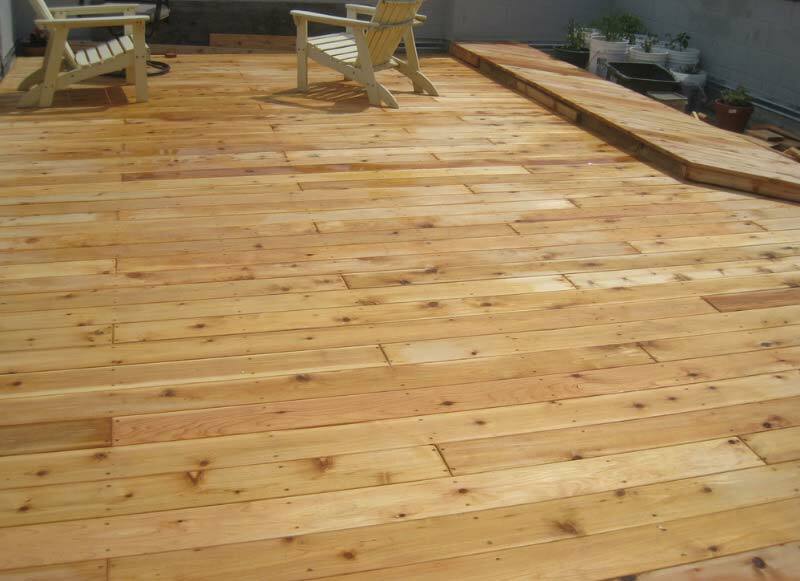 Decks are particularly vulnerable during the long winter months in Toronto, weathering due to direct sunlight, pooling rainwater and large amounts of traffic. Seasonal or possibly annual inspections should be performed to help keep maintenance to a minimum and avoid costly repairs. When inspecting your deck, walk around looking for visible signs of peeling stain, weathering or blistering. Look for green areas which are a sign of algae. Algae by itself are not harmful to the wood cells but are a sign of excessive moisture which can ultimately cause rot. Black areas are a sign of mildew which is especially evident when the deck is wet. These areas can be cleaned with percarbonate bleach followed by a light power washing. Many log homes have porches in which the roof is supported by posts. The bases of these posts are often hidden under the deck floors and are in ground contact keeping them continually wet and exposed to insects. As decay sets in, these posts shorten with the weight of the roof and deck above. The roof eventually sags, and expensive repairs are the result. Deck surfaces cause water to splash back onto adjacent log surfaces. These areas require more frequent inspections, cleaning, painting, and staining. Gutters should be installed to prevent rainwater from contacting the deck closest to log walls. Besides, metal grating installed in the deck floor directly beneath roof overhang will help reduce backsplash. Flashing the lowest log course will also direct water away from the log. These lower log courses at deck level are very problematic for many owners of their homes, and these simple steps may save expensive wood replacement in the future. Protecting your deck and rail with a quality finish is an important factor in the maintenance process. The most common sources of degeneration are direct sunlight and standing water and in Toronto, we are facing with both quite a lot. With proper cleaning and a quality deck finish, these situations can be significantly reduced. Many stain manufacturers offer environmentally friendly products to safely clean and protect your deck. Most manufacturers offer a broad range of color choices and will provide sample colors upon request. Supporting post bases are particularly vulnerable to decay because the ends tend to draw moisture up the post. Be sure your posts sit on cement or stone footings well above ground level. Some post bases have metal risers which help keep water from being drawn into the post end. A common place for log decay is at the bottom of the deck rails. Water tends to pool where the log rail meets the horizontal supporting log. That can be avoided by drilling “weep holes” in the bottom of the rail to allow rainwater to pass through the support log and allow drying. The top of your deck rail support posts also absorb moisture and over time will begin to decay. Caps should be installed to eliminate this obstacle. Post caps are often made of copper but can be other metals or even wood. Stairs are exposed to the elements even if the porch is covered. Stairs always end at the bottom, and this is where most problems happen. Be sure that the bottom of your stair sits on a cement slab or stone base and is not in ground contact. Even with this precaution, it is susceptible to the backsplash. For this reason, stairs require more frequent inspection, cleaning, painting or staining. 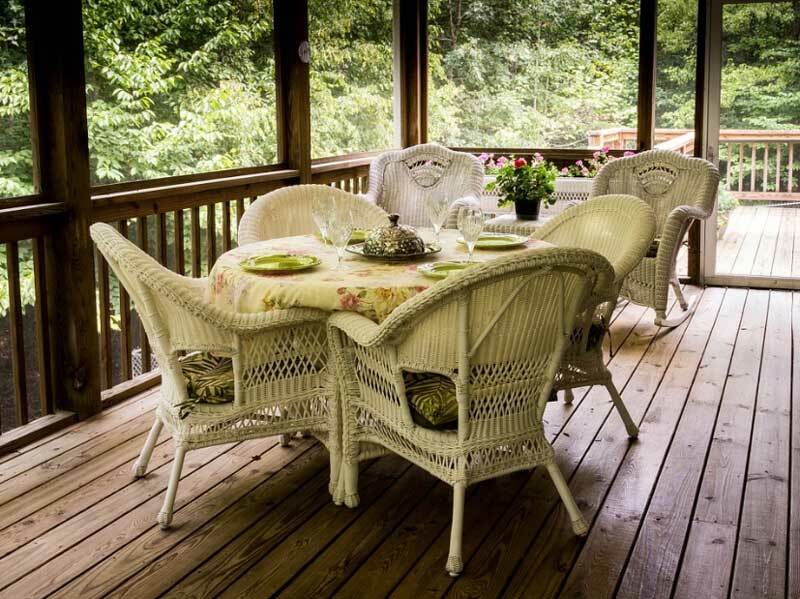 Decks and porches are aesthetically appealing, provide more living space and are great places to entertain and relax. Safely enjoy your outdoor living with frequent maintenance and care using quality products and implementing these cost effective measures. Find out more information about outdoor wooden structures on our website at https://deckcrew.ca/.